Turn your backyard into an oasis with Norway Built's Four Seasons LifeRoom. This totally customizable outdoor space can be constructed to suit your unique style and tailored to your outdoor needs. With LifeRoom your backyard will never be the same, offering you the freedom to enjoy all the beauty of the great outdoors in ultimate luxury and comfort. 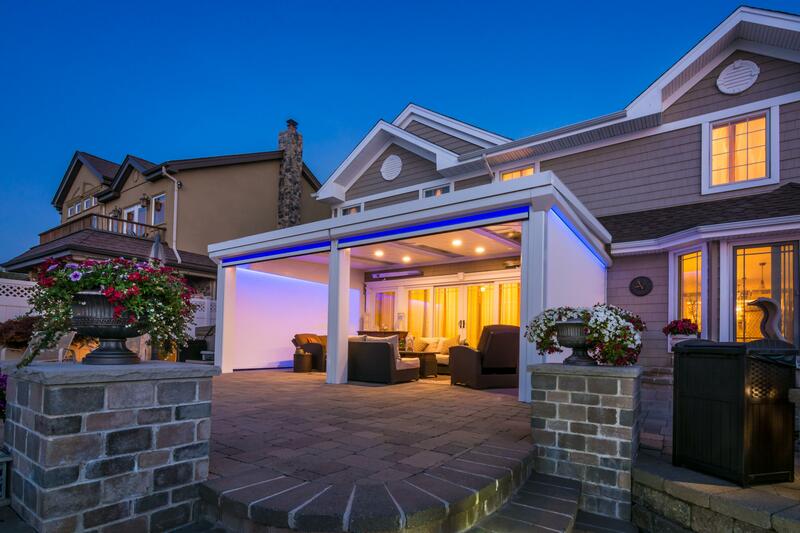 Screens: With fully automated, remote-controlled screens, you can control the level of outdoor comfort and privacy all with the touch of a button. 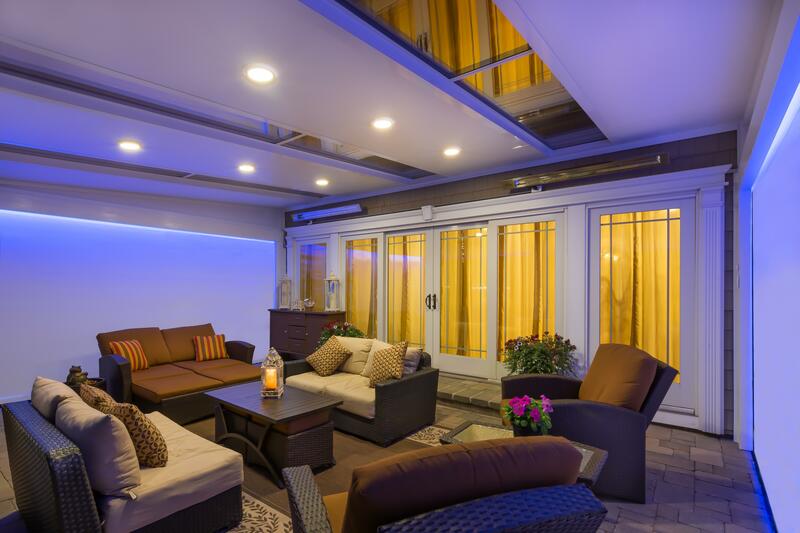 The retractable screens guard against inclement weather, insects, pests and nosy neighbors. You can turn your outdoor oasis into an indoor recreation area instantly. Entertaining: Game night, movie night or a romantic evening in, LifeRoom can entertain it all. Round up your friends and family, gather around to watch movies, TV shows and sports games all in the comfort of your backyard. 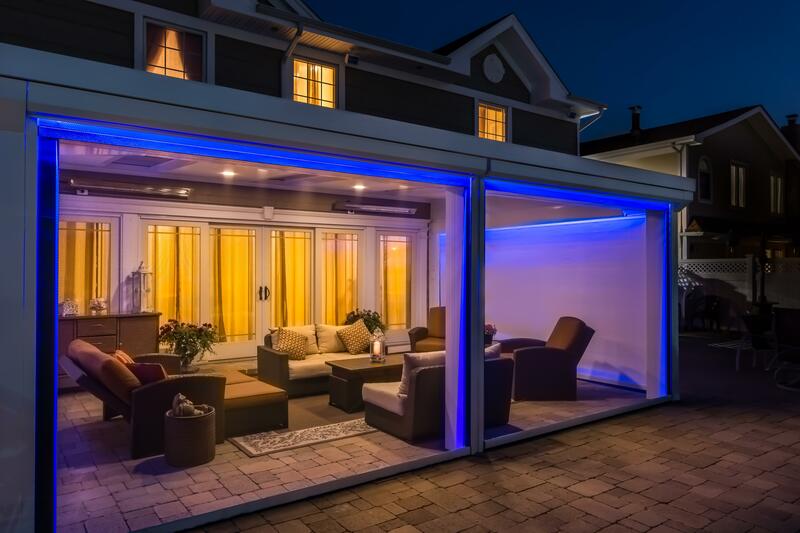 With our retractable screens, you can instantly create a home theatre. LED Lighting: Entertain all night long with LED lighting that can turn your backyard into the trendiest club in town. Want to host a party privately? Pull the screens down to turn it into a hidden VIP room! Cool Mist Technology: Our ultra fine mist is so thin that it disappears and can reduce temperatures up to 40 degrees. With our retractable screens being able to block 95% of UV rays, you have assured a healthy, safe environment that guards against the stifling sun. Connecting with the outdoors has never been safer or more entertaining than with a Four Seasons LifeRoom from Norway Built. Revamp your backyard to reflect your funloving personality – with the ability to host outside no matter the humidity or the weather, to effectively control outdoor privacy, protection and entertainment, what is there to consider? Contact us today to schedule your FREE, no-obligation Four Seasons LifeRoom consultation with Norway Built. We serve Chicago Suburbs, including Downers Grove, Naperville, Plainfield, Elgin, Aurora, Bolingbrook, Schaumburg, Saint Charles, Hoffman Estates, Wheaton and nearby.